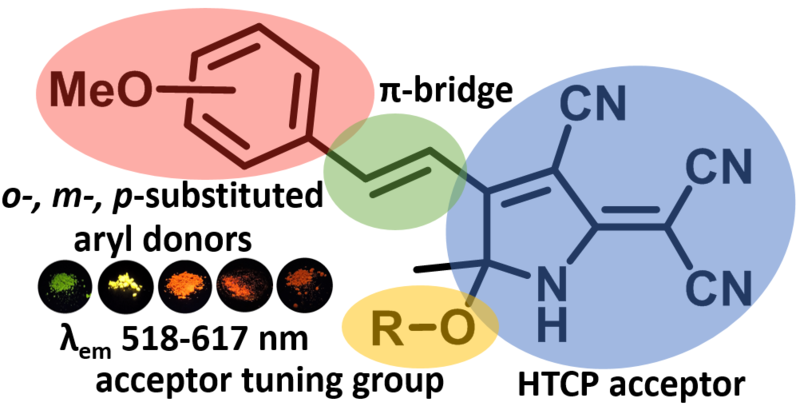 The approach to novel group of donor-acceptor chromophores exhibiting solid-state fluorescence based on the reaction of hydroxytricyanopyrrole (HTCP) acceptor with methoxybenzaldehydes has been developed. The presence of a hydroxyl group in the structure of synthesized chromophores allows functionalizing them and tuning their fluorescent properties, varying maxima of emission in a range of 518–617 nm. 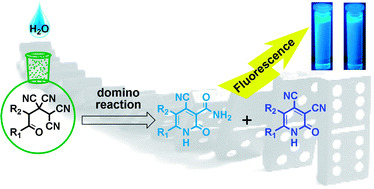 The developed method is of interest as it is a promising approach to a new group of fluorescent push-pull D-π-A chromophores, which are functionalized analogues of known chromophores based on the tricyanofuran (TCF) acceptor. We discovered a new method to methylate tertiary amines such as urotropine, triethylamine, pyridine, 2-methylpyridine, 4-acetylpyridine, and isonicotinamide, up to quaternary ammonium compounds, with 1,1-dicyano-2-methoxy-2-oxoethane-1-ide being the counterion. Quaternary ammonium compounds of 1,1-dicyano-2-methoxy-2-oxothane-1-ide were synthesized within a single stage by stirring methanol solutions of tertiary amines with ethene-1,1,2,2-tetracarbonitrile (ETCN) at room temperature. In the reaction of ETCN with tertiary amines in methanol, processes occur that form the 1,1-dicyano-2-methoxy-2-oxoethane-1-ide fragment with simultaneous N-methylation. Crystal structures based on X-ray diffraction analysis of the obtained compounds were studied. .
A series of novel pyridine derivatives containing tetracyanobutadiene moiety (4-CN-TCPy) were obtained in good yields by the reaction of 2-chlorosubstituted pyridine-3,4-dicarbonitriles with malononitrile using Cs2CO3 as a catalyst. The resulting 4-CN-TCPy are stable intensively colored substances possessing a solid-state emission in the red and near-infrared region. Solutions thereof are characterized with a strong solvatochromic effect as well as weak blue fluorescence. A facile approach to the synthesis of novel 2-diethylaminocinchomeronic dinitriles, which are found to be fluorescent both in the solution and in a solid states, was developed. Absorption, fluorescence and solvatochromic properties as well as a crystal structure of the synthesized compounds were investigated. It was found that the 2-diethylaminocinchomeronic dinitrile derivatives with methoxy groups in the aryl moiety possess the most intensive emission in nonpolar solvents with fluorescence quantum yields up to 0.59. A novel route for synthesis of 2-acyl-1,1,3,3-tetracyanopropenides (ATCN) salts is reported. The starting aryl(heteroaryl) methyl ketones were oxidized to the corresponding α-ketoaldehydes by new a DMSO–NaBr–H2SO4 oxidation system. The subsequent stages of ATCN preparation are realized in aqueous media without use of any toxic solvents, in accordance with principle 5 of “green chemistry”. These salts show a good potential for synthesis of five- and six-membered heterocycles and may serve as potentially useful ligands in coordination and supramolecular chemistry. Several novel pyrrolo[3,4-c]pyridine derivatives were synthesized in good yields via hydrolysis and intramolecular heterocyclization of vicinal substituents in compounds of pyrid-2-one series. Both synthesized pyrrolo[3,4-c]pyridine-1,3,4-triones and 1-iminopyrrolo[3,4-c]pyridine-3,4-diones are fluorescent in various solvents with emission maxima in the blue-green region of the spectrum. A novel convenient approach for the synthesis of densely functionalized pyrano[3,4-c]pyrrole derivatives was developed. Cascade transformation of the simple adducts of tetracyanoethylene (TCNE) and ketones (4-oxoalkane-1,1,2,2-tetracarbonitriles) in the presence of aldehyde under the action of acetic acid led to the diastereoselective formation of targeted pyrano[3,4-c]pyrroles. The reaction pathway was thoroughly investigated, and proposed intermediates were shown to be consistent with experiment. The first example of glycine-catalyzed direct domino synthesis of 6-imino-2,7-dioxabicyclo[3.2.1]octane-4,4,5-tricarbonitriles in aqueous medium is described, giving products in excellent yields and moderate to excellent diastereoselectivities. This approach provides a highly efficient and environmentally benign access to cyano-substituted 2,7-dioxabicyclo[3.2.1]octane. Non-catalytic conversion of 4-oxoalkane-1,1,2,2-tetracarbonitriles in the presence of water leads to the formation of a mixture of fluorescent 4-cyano-2-oxo-1,2-dihydropyridine-3-carboxamides and 2-oxo-1,2-dihydropyridine-3,4-dicarbonitriles in equal proportions. This transformation was explained, spectral-luminescence properties were investigated, and fluorescence quantum yield was measured..